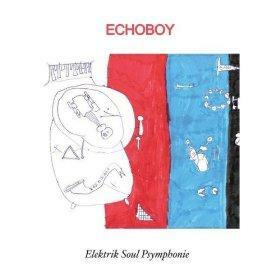 Echoboy - "Elektrik Soul Psymphonie"
Echoboy... he's done some good pop, some saccharine pop, some solid electro/space-rock, played with Spiritualized and others, produced this and that. His latest full-length effort is an ambitious hour-long 20-tracker, and has some choice cuts that deserve your attention, interspersed with compelling interludes as well. The opening song is a somber piano ballad which half-way through becomes hopeful-sounding...segue into "Lovesick Antelopes", a wonderfully melodic, driving space-rocking tune with lightly treated vocals. "Elektrik Soul Suite" is a piece of quiet pretty keyboard lines over an elektro/dance-beat evolving into continuously pleasant melodies, and into the reverbed percussion, tambourine shakes, synth squigs and '60's-style psyche-blues riffing of "Death Drums". Great tune. "Interlude No. 3"... lots of fun with fx, chuck in some harmonica... seque into the rolling loopy turbulence and kitchen-sink fx of "Pale"... and another groovy bass-line. "Jet Brown": A sad piano tune and the heavy cymbal-washed drums of Kevin Bales (one of a few relatively sparse other-than-echoboy contributions). If there's a weak spot it's the overly-extended annoying loops of "Yellow Stripes". There are other tracks that don't do much, but they're brief. "Plastic Gods": Ahhh graced with the accordion, a really sweet wistful melody played here. "Innocent Clueless & Young" is strong again in melody, with orchestral horns delicately complimenting lofty keyboards. "Interlude No. 6" reprise piano... finally: "43", an orgasmic stew of echo-drum stomps, gorgeous Hammond organ and other shimmering synth-tones...a breath-taking closer. To be objective, you wonder if maybe the Echodude could be a master of either song-writing or sound-scapes and experimentation should he apply more concentration to one or the other. But as it is, he's a jack-of-many-trades and has given us an album prolific with ideas, bright spots and the occasional hit-track.